Dr. Wu' does indeed have friends. Very tallented Bluesmen friends. They really pulled it off again with this second CD. Volume two features several tracks with Buddy Whittington on vocals as well as his lightning blues guitar riffs. Charlie Bassham is back with his great blues vocals as well. The lyrics tell some great stories such as the tragic story of how lives can be changed at the blink of an eye on "Bryant Irvin Road." My hat's off to Dr Wu' and friends. I hope you've started volume three because it wont take long to wear this one out just like the first. You should make an appointment with Dr. Wu'! 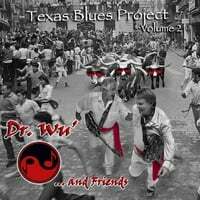 Jim Ashworth & Bryan Freeze aka "Dr. Wu'" with the 2nd volume of their "Texas Blues" Project. If you like Vol.1 than this disc should be a must have. If you don't: Hurry up to get you a copy of Vol.1 & 2! You will not regret it! Tragically Mace Maben who is part of Vol.2 passed away after the recordings. So did Stephen Bruton after the first Dr. Wu' album. Bryan & Jim wrote a wonderful dedication to Stephen called "Slow' Rollin Train" (see YouTube). R.I.P., Stephen & Mace! The CD is well produced sounds great and comes in a nicely packaged digipak with booklet. Any lover of Blues music with a good dose of Rock should make an appointment with Dr. Wu'!